It's never too late to begin orthodontic treatment, but when it comes to your youngster's teeth, did you know that earlier treatment might be better than later? At Tilghman Orthodontics, we believe that understanding your child’s oral development at a young age is the key to giving them the perfect smile. But what is it that makes an early evaluation and treatment so important? According to the American Association of Orthodontists, children should have an early orthodontic evaluation no later than age 7, because by then most will have developed their first set of adult molars. Drs. Tilghman and Schwartz can then examine your child, to detect early growth and development patterns, and assess whether or not early intervention is necessary. Our friendly and considerate staff fosters a family-friendly environment, while working hard to create personalized treatment plans that comfortably cater to your child’s needs. Why Is It Important To Seek Early Orthodontic Treatment? It’s important to note that early evaluation isn't necessarily followed by early treatment. In most cases, we simply perform an initial consultation exam, and subsequently monitor your child's growth patterns until it's time for treatment to begin. Growth patterns and other developmental markers allow us to identify the front to back and side to side relationships of the teeth. For example, early treatment can help us prevent crowding, by making sure there’s adequate room in the mouth for all of the permanent teeth to grow, and if there’s not, we can intervene with spacers and expanders. When Does Treatment Usually Begin? Severe Overbite – When the upper teeth close inside the lower teeth, a device called a palatal expander can be used to gradually and painlessly widen the upper jaw. This is especially effective when the jaw itself hasn't fully developed and without early intervention, oral surgery may be necessary. Severe Crowding – This occurs when the jaws are too small to accommodate all of the permanent teeth. Either palatal expansion or tooth extraction may be recommended at this point, to help the adult teeth erupt properly. Even if braces are required later, the treatment time will be drastically reduced with early intervention. Severe Underbite – A severe underbite, caused by the lower jaw growing much larger than the upper jaw, can result in premature oral health issues and self-esteem issues. Using braces and other orthodontic appliances, we can intervene early and avoid potential surgery. Sometimes your child's parafunctional (detrimental to health) habits can actually influence the development and function of his or her teeth, jaws and mouth. It’s important to observe them, and talk to Drs. Tilghman and Schwartz if these habits persist. Thumb Sucking – This occurs naturally in early childhood and usually disappears between ages 2 and 4. However, over time, the pressure of the digit on the front teeth and the upper jaw can actually cause the teeth to move apart and the jaws to change shape. This can lead to “open bite,” and which could cause eating and speech problems. Mouth breathing – When the mouth always remains open, passing air directly to the lungs, alterations in the muscular function of the tongue and face can occur. 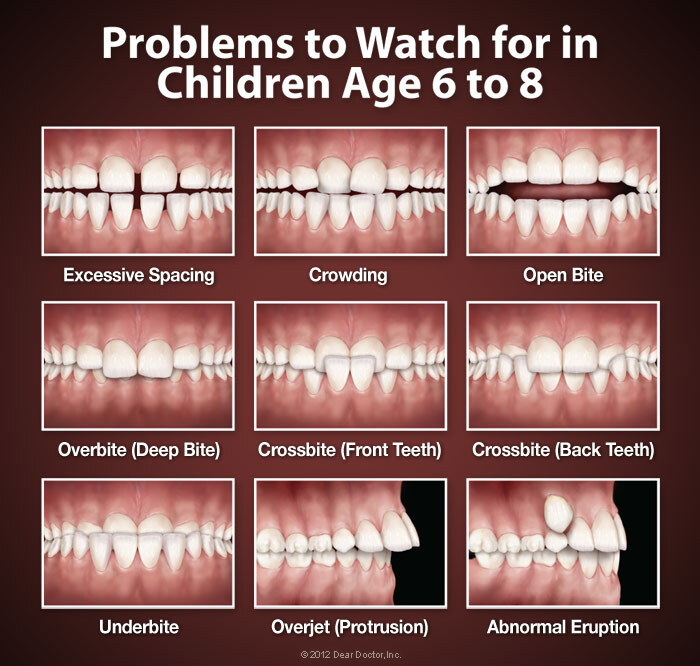 It may cause the upper and lower jaw to grow abnormally, which can lead to serious orthodontic problems. Various orthodontic treatments are available to help correct these parafunctional habits — and the sooner they’re resolved, the less damage they may cause in the long term. Get an Early Screening Today! With two convenient locations in Salisbury and Berlin, our goal is to correct as many smiles as possible throughout Wicomico and Worcester counties. If you believe that your child could benefit from early orthodontics, give us a call at (410) 742-4813 and schedule your free consultation. One of our dedicated team members would be happy to assist you. Choose Tilghman Orthodontics as your provider, and we guarantee you’ll love your smile.